I fell in love with the original Scream after watching the first five minutes. When Wes (we are not worthy) Craven killed off the “name” star in the first reel. With this one action he showed us, the audience, that he knew and loved horror films and thrillers. The little nod to Hitchcock’s killing of Janet Leigh at the beginning of Psycho told me immediately that this was a film-maker that was going to have fun with the genre. 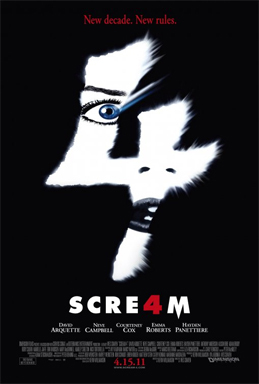 Scre4m aka Scream 4 is the last of the Scream franchise. I had real reservations about the last of the Screams. I was afraid that Wes had gone to the well once too often and that the bucket he drew up would be empty. Boy was I wrong. This was a brilliant end to a series that has always shown a stroke of genius in each sequel. Yes I know that Wes cannot take all the credit. These films work because of the writing and the acting as well. Scre4m opens with a murder similar to the first Scream films. Although it comes to us initially via various trailers to the fictional Stab films in the Scream verse. We are introduced to Sidney Prescott’s cousin Jill, played with great panache by Emma Roberts. We then get to see all our favourite living characters from the previous films. Deputy Dewey, played again by David Arquette, is now the sheriff of Woodsboro and has married Gale. Gale Weathers-Riley, played by Courtney Cox, has retired from the mainstream news world and is trying to write “the great American novel” and not getting very far with it. Sidney Prescott, played again by Neve Campbell, is now a writer. Her book, about living through and dealing with the events from the previous films, is a bestseller. She returns to Woodsboro as part of her book signing tour. We also meet the new cast of “victims.” Hayden Panettiere as Kirby Reed, one of the slew of friends that Jill has, makes the most of her part. She was born to play this kind of role. I of course still think of her as the cheerleader from Heroes, you know “Save the cheerleader save the world.” But she does a brilliant job as the future “man-eater” Kirby. The other memorable friend of Jill’s is Rory Culkin as Charlie Walker. Charlie is the Randy substitute in this Scream film. A necessary replacement since Randy is dispatched by Ghost Face in Scream 2. Although not in the victim department I have to mention Marley Shelton. As Deputy Judy Hicks she rocked it out of the park. Her characterisation of the love lorn Deputy Judy was both comedic and scary, sometimes at the same time. Of course Ghost Face is still voiced by Roger Jackson. Could anyone else have done it? I think not. His voice is synonymous with Ghost Face and always will be. I can’t reveal anything else about the plot because I will be heading into spoiler territory if I do. I can and will tell you it deals with the theme of the internet and it’s propensity to make celebrities out of those who know how to use it. So that’s it. I have, like so many other Scream fans I am sure, waited for this film for ages. I loved it so much that I sat through two viewings on two separate occasions. I also couldn’t wait for a special edition blu-ray to come out. As much as I want special features, in this case it did not matter. So hats off to Director Wes Craven for once again pulling it off. The grande finale of all the Scream’s was nigh on perfect.